It’s Monday again and I am so engulf with the blues. 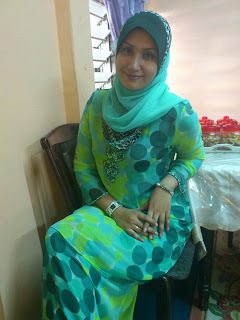 It has been so nice embracing Eid holiday for the entire week. Lucky me that Uncle Din was also given 1 week of Eid holiday so there wasn’t any petty quarrel over whose tired returning from work or who’s enjoying more holiday. Anyhooo, happy Monday people and I believe everyone has resume to work today. Redha jer laaaa yea. How was your Eid this year? 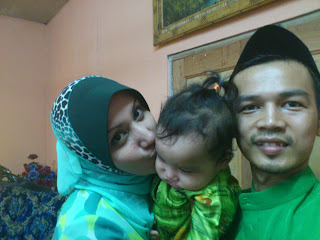 I had a blast this year mainly because I celebrated 1st week of raya in Kelantan (yeap, his turn). KAMPUNG BADAK MATI. We traveled to Kelantan on Thursday and endured a 10 hour journey. It was ok though as we traveled early in the morning and arrived safely by noon. Since Ramadhan is a shy of 3 days away, Maa made Nasi Kerabu for us and I must say I think I had enough of Nasi Kerabu for the moment as I ate them for three days in a row. To complement Maa’s serving, we went to the nearest bazaar and we stumble upon Daging Bakar. It looks like a humongous beef satay which cost RM5 per stick and it was so appealing. We were fasting and definitely we felt so compelled. Maa on the other hand really spoil us for iftar with her overwhelming Nasi Kerabu, air kelapa, ayam percik and cempedak goreng. Oh my….. I shed a few kilos prior coming to Kelantan and it hasn’t been one day of our stay I was already counting calories. Alhamdulillah God has blessed both us with an abundance of sustenance whereby I received bonus from Proton & PB biz while Uncle Din got some from his company. In conjunction with his fortune, he bought me an air-cooler & steamed iron to comprehend our stay at his kampung. Hehehe… Terbaik raya… Dah mcm dobi bilik aku malam tuh gosok SEMUA baju raya kami 3 anak beranak for the entire stay and gantung kat dinding. 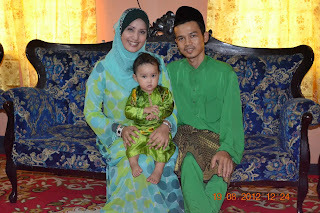 I just love the notion of preparing my husband for solat Raya; helping him with the baju melayu, button him up and fit the sampin around his waist. I love watching him cladding baju melayu as I truly believe men look dapper in them. Piya had a new experience too; her very 1st attempt in baju kurung. I had to roll her sleeves and waist band though because she wasn’t use to it. She likes to run around and keep falling to her feet in the baju kurung. Of course I have a hands-full of photos so I have to post this Raya entry in staggered.